You could say I’ve claimed it as “mom’s room” using squatters rights. You see, this is where all the magic happens. … and plotting my next remodel. I finished up this room in the early fall. And it was a big project. Lots of lumber and nails and caulk was involved to install the board and batten wall treatment. And I debated if it might be a bit too much. But in the end, I’m so glad we went for it. It really does brighten up the space. and grocery store flowers. 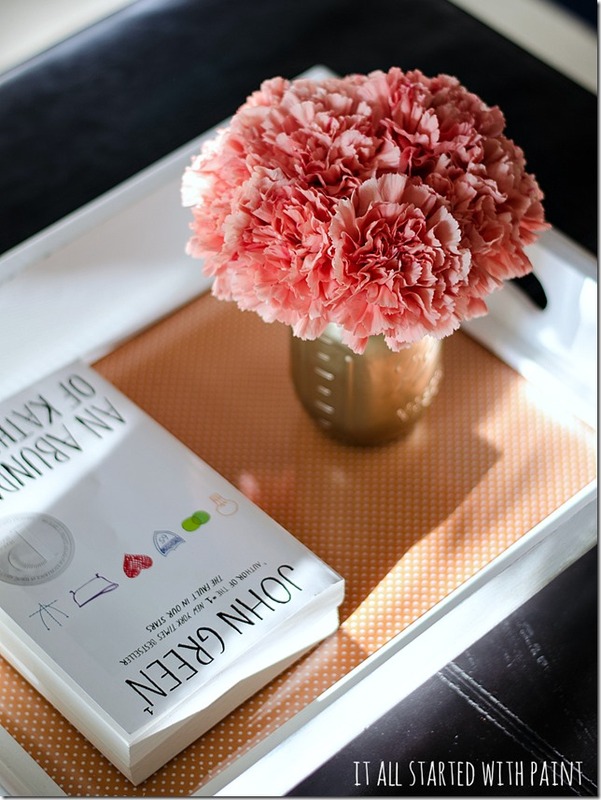 Thank you so much Kim for inviting me into your blog home to share a piece of mine! Thanks so much, Linda, for sharing your favorite room. You and I both have our own space where we do much of the same things and I am loving the navy and white. 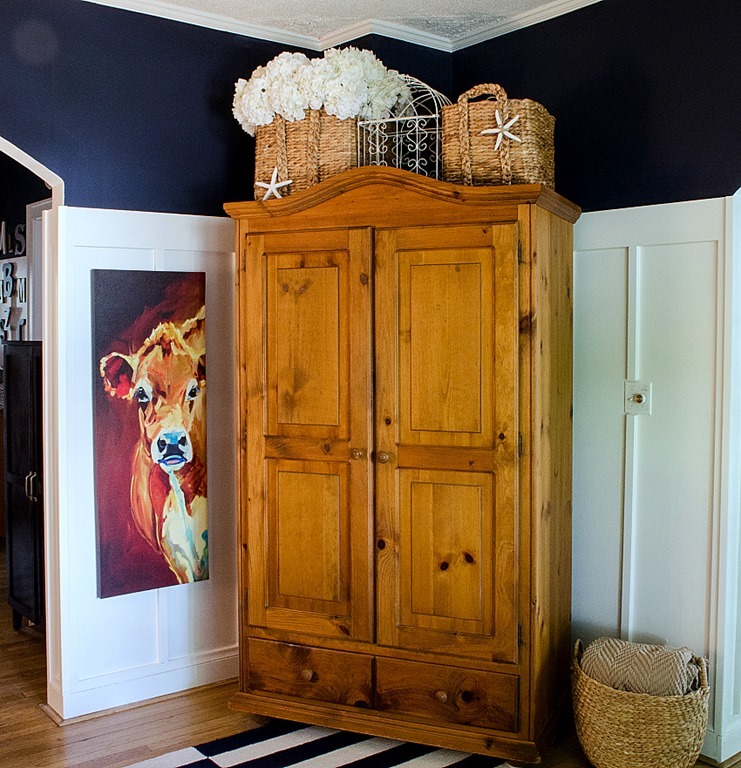 If y'all don't know Linda and her blog It All Started With Paint please go over and say hi and check out some of her other projects. I sure hope y'all have a wonderful Mother's Day weekend. I will be going to my niece's bridal shower tomorrow with my daughter and granddaughter. I won't be spending any time with my mom since she is travelling, but I am sure she is having a grand time. Very dramatic and gutsy, but I LOVE it! Thanks for posting. Really like all the graphics and, of course, that board and batten. I love blue and white also - I am always drawn to a picture that has blues and white in it. I know the feeling of being in a spot for inspiration, my place is in my family room - I can see the dining room and kitchen from the place I sit in. MY spot is the oversized chair in the family room - I just look around and I always have so many thoughts running through my head. It's just my pocket book that is always empty.. I love, love, love Linda...been a "fan" of hers for a long time....Linda is talented, gutsy, and FUNNY! !...She cracks me up every time I read her posts...I love following her along in her room projects, one of which was featured in a magazine...I love her "favorite room"...the board and batten is so beautiful....She did a great job...as she does in every room in her home!...Great feature today Kim...and Have a great weekend and Mother's Day Kim and Linda!!! What a wonderful room! 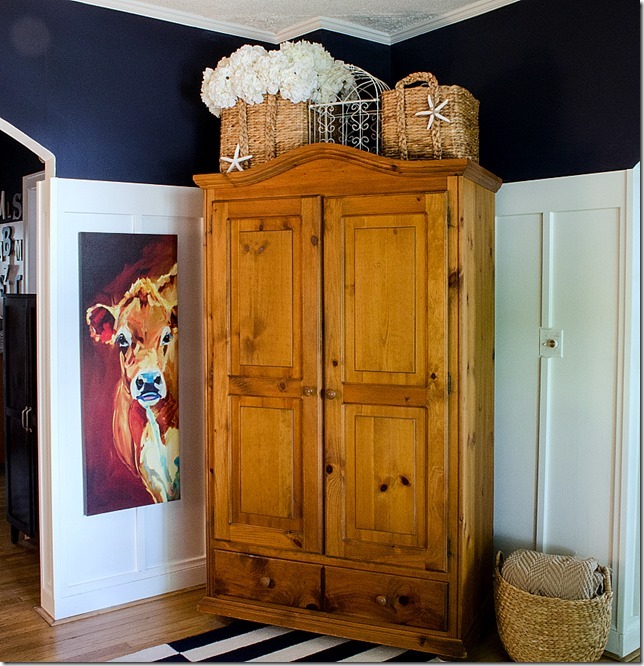 I love the board and batten and the navy color at the top! Thanks so much Kim for having me -- and thanks to your readers for their lovely comments! I'm floating on air today! Linda's living room is STUNNING!!! 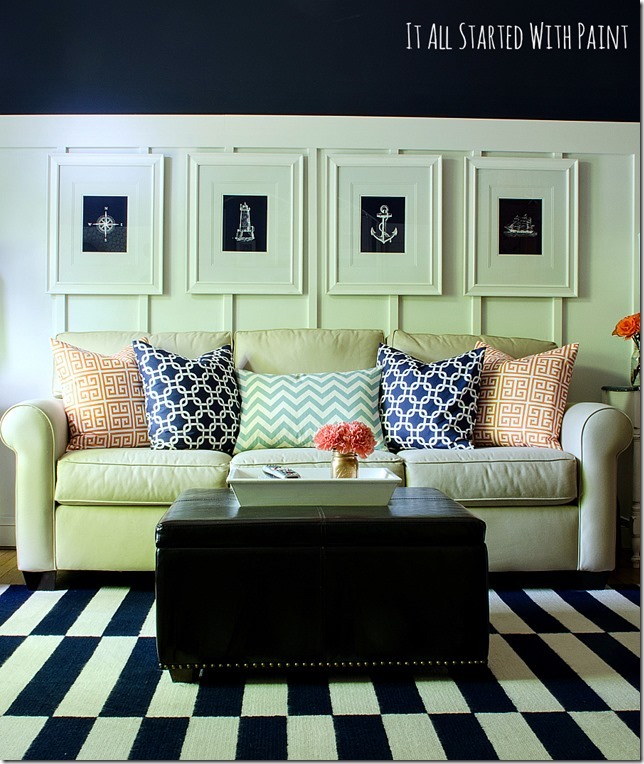 I love the navy and white combination and all the wonderful contrasts in the room. She has such a refreshing beautiful style!! Kim, what a great feature! 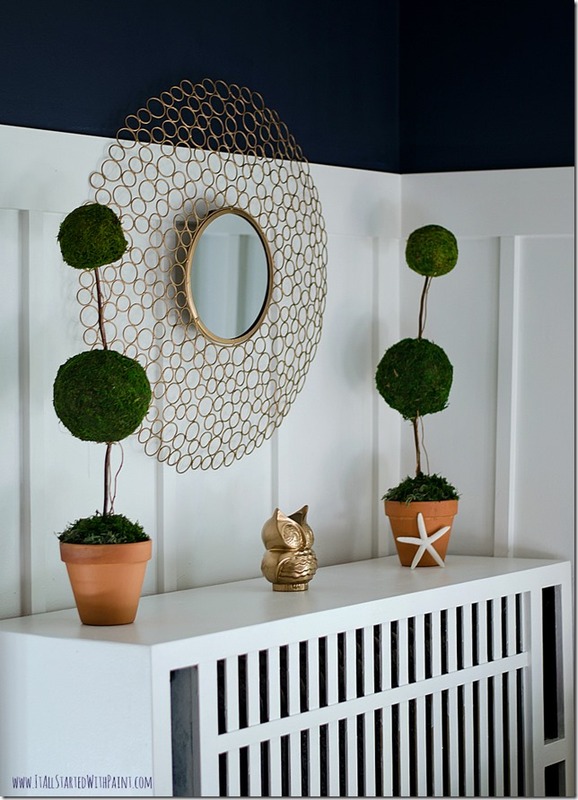 I love this navy and white room! Well, I love Linda's home and style, timeless! Speaking my language with navy and white! Beautiful room! Looks professionally done. Great job, Linda! And good blogger to feature, Kim! Love this room. I would gladly sit in Linda's favorite room. I love it...every detail. Great gal to feature today. Love it! 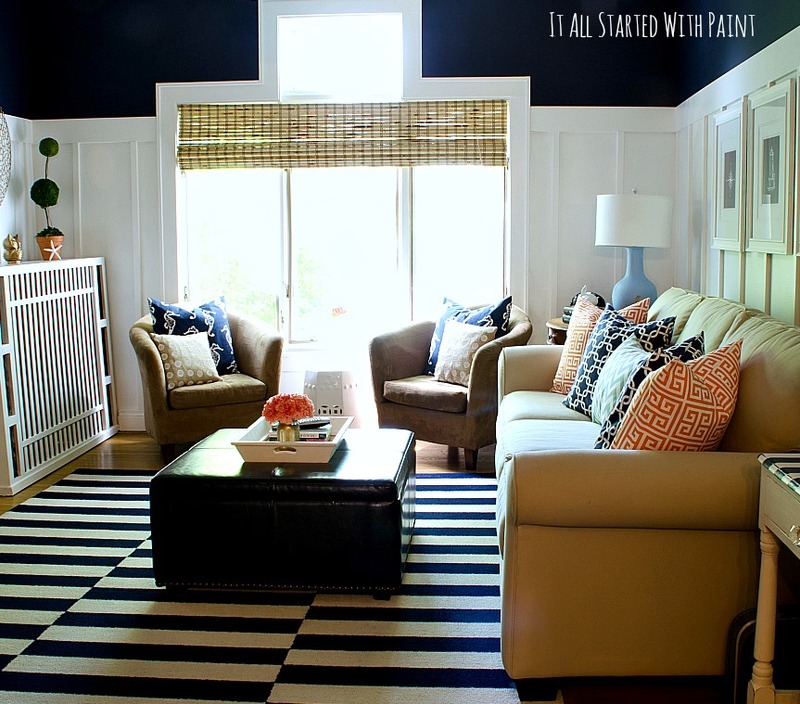 The colors are gorgeous and it is so my style! 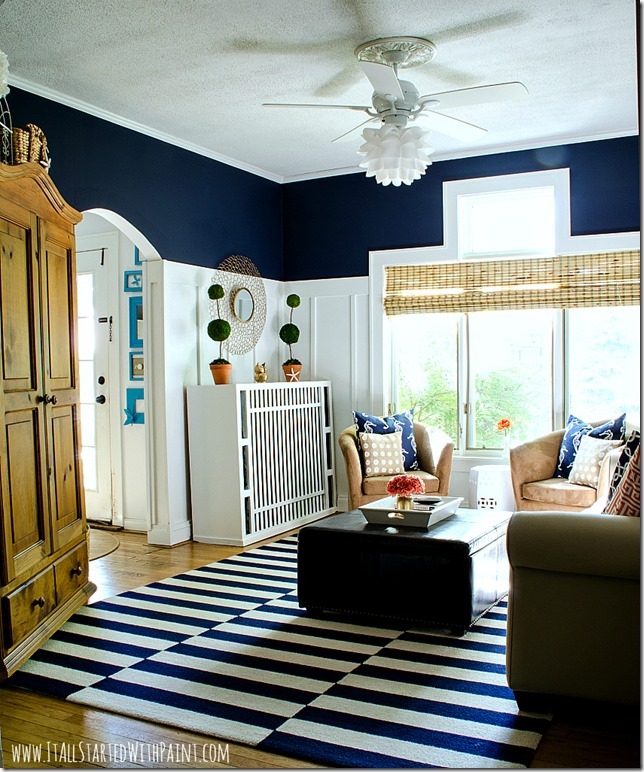 I have a blue and white striped rug in my office. 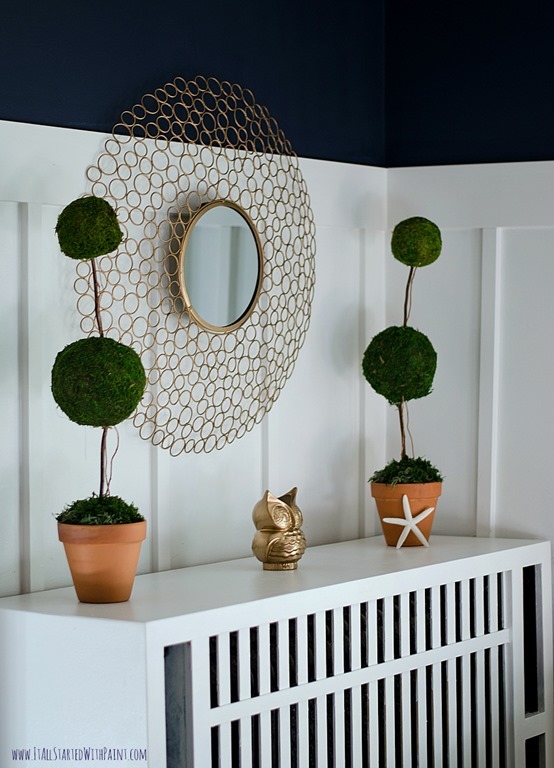 Now that I see it with navy walls, it has me thinking... Great feature! Fantastic room! There's something so fresh about navy and white. I have always been drawn to that combo. Lovely, lovely space! Linda, your room is awesome, what a perfect place to relax, oh my! 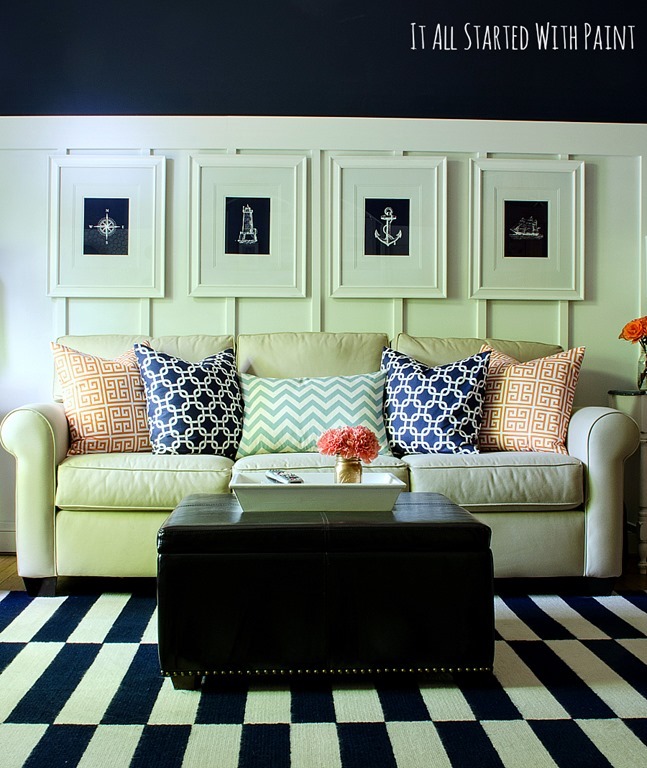 I love navy and white, so classy and comforting. Great feature, Kim! Love this light bright room....and that navy and white rug really works so well! Thanks for sharing this pretty room with us. What a beautiful space - love the board and batten wall treatment - it makes for such a light, bright space! And I'm digging that cow! And Linda is a girl after my own heart claiming this space as "mom's room" - smart girl! Linda's rug might have been her inspiration, but Linda herself is an inspiration.